'Keyhole' Asian design wooden Plate, Platter and bowl stands finished in 'Mahogany' colour. 'Keyhole' Wooden Plate Stands in rich 'Mahogany' colour. 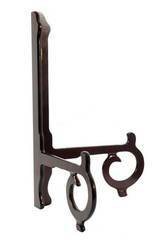 Folding stand with quality brass hinges with an Asian design available in 5 sizes.